When it comes to getting rid of bats, the experts at Animal Trappers Orlando will get the job done! And we are here to guide you through every step of the bat removal process—from identifying bat problems to locating and removing bats, and even ensuring long-term bat pest control. Animal Trappers Orlando guarantees our professional bat removal services. Bat Droppings and Odor Problems. Bats are extremely beneficial to the ecosystem, the environment and even to humans, as bats have contributed to such medical advancements as development of navigational aids for the blind. Despite this, there are times when bats become a nuisance to homeowners or business owners. If you notice bat droppings, or guano, chances are, you have a bat control issue. Individual droppings are small, back and shiny, often being found on attic and porch floors. When bats roost in large numbers inside buildings, the accumulation of bat droppings can create an unpleasant odor that is unhealthy to humans. Many people are afraid of contracting rabies from bats. Though bats can become infected, rabies rates in house-dwelling bats are very low. Regardless, bat pest control will eliminate your having to worry about any of these potential problems. 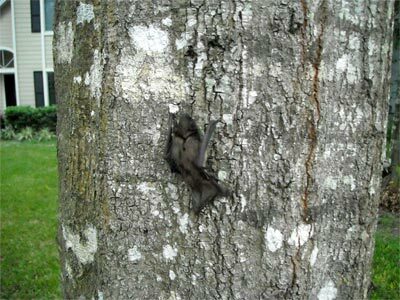 Bats will be safely removed from your home or business with help from the experts at Animal Trappers Orlando. The first step of bat control inspection is to identify structural entry points bats might use. Common entry points include down chimneys/openings around chimneys, through vents, under loose shingles, under siding, through open doors and through open, unscreened windows. Bats will likely emerge just after sunset so it’s best to observe the building at that time. It’s also necessary to examine the entry points in the daytime so that none are missed. Our bat removal specialists will find these entry points and then seal up any problem areas. The next step to getting rid of bats for good is to install exclusion devices. Bat exclusion will successfully and permanently remove bats. Our bat control experts carry out this process by positioning one-way devices at all locations where bats are emerging from the roost. The bats will then be allowed to exit, but the devices will not allow for reentry. The devices must be in place to allow enough time for bats to escape. Once bats are properly removed, our experts will permanently seal openings.